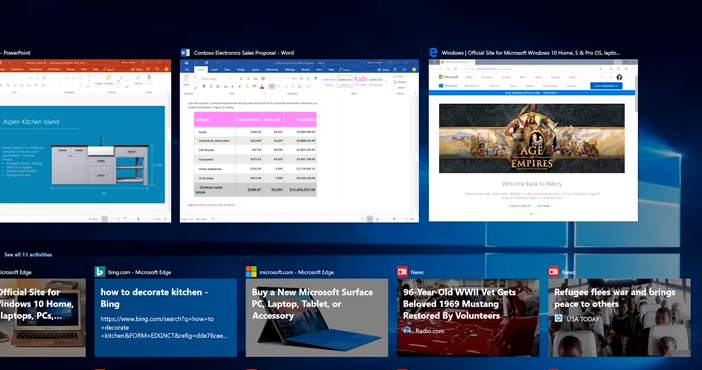 Check out the most exciting new features for Windows 10 below. With the new Windows 10 updates comes a redesigned Xbox Game Bar. The new bar features a clock, live profile, recordings folder, and mixer shortcuts. You can view all of your current windows as well as items you have accessed over the past 30 days using Timeline. This helps save time from having to search your computer for a document you recently accessed. This feature allows users to dictate to their computer and it will be written immediately in the text field open. All you have to do to activate this feature is click Windows + H. Watch the video below for a demonstration of this feature. Focus Assistant, previously known as Quite Hours, is a do not disturb option on your PC or tablet. The feature has several settings, including priority only and alarms only. There are many new features on Microsoft Edge. First, you can mute a page’s sound by clicking on the sound icon on the tab. So, if you have a video playing on a page you don’t want to hear, you can mute it. Also, with Clutter-free printing, you can print out web pages without all of the extra unnecessary pages. Lastly, Edge now has grammar tools which allow online readers to break up words into syllables, and highlight nouns, verbs, and adjectives. Before, password recovery was only available to those who signed into their PC or tablet using a Microsoft account. Now, people who use a local account to login can create three security questions to answer to recover their password. A select amount of users will be able to use this Windows 10 update for right now. It will be available to all on May 8th, 2018. Windows is already working on their next update codenamed, Redstone 5. Check out our other technology news blogs on Digital Addicts! Previous ArticleAvengers: Infinity War Hits Theaters Today!